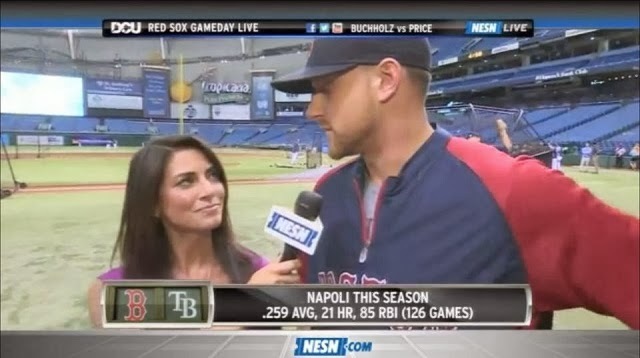 Much has been made about Jerry Remy's return to NESN but what about Jenny Dell? In case you did not know, it appears pretty official that Jenny Dell is now dating Will Middlebrooks. These tweets and pictures over New Year's Eve show that pretty clearly. Then came this post from Fenway Pastoral and Jenny Dell's "scoop" that Will has been getting some work in at second base. While everyone was waiting to see if Jerry Remy would return to NESN the same question was being asked about Dell. Would the Red Sox and NESN really allow her to keep her current role while openly dating one of the players? The answer is no. Not long after the Remy return announcement, NESN stated that Jenny Dell has been taken off the Red Sox games and will be doing other things for NESN like working the NESN sports desk. There are also rumors that she could be leaving for Fox Sports 1. Catherine Varitek had an interesting tweet about the situation. Heidi Watney, the reporter that Dell replaced was rumored to have an affair with Jason Varitek while he was married to his first wife. Watney or Varitek never confirmed the rumor but many feel it is what led Watney to move on from the job. As for Middlebrooks working out at second base, on one hand it is good news because it means that the Sox are close to signing Stephen Drew. This excites me since as I posted before, the Red Sox need Stephen Drew. On the other hand it makes no sense, Middlebrooks is not the answer as the Red Sox utility guy. If Drew is signed, the best place for WMB is not on the 25 man roster as a utility guy but down in Pawtucket getting at bats and working at third base and first base.